Search engines are the top source for provider research, but 2 out of 3 consumers still prefer to call to book. Consumers prefer to receive a referral from a provider (38%), but 90% still perform due diligence before booking. 4 out of 5 people said appointment availability is extremely/very important; 61% have previously continued their provider search to find an earlier opening. This report helps health systems understand what consumers prioritize most—and least—when looking for new providers, how appointment booking preferences vary among age groups, what capabilities consumers want on health system websites, and more! 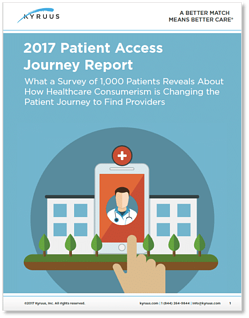 Download your free copy of the 2017 Patient Access Journey Report today!